Even before the first kick of the World Cup, competition between the teams is already fierce. Over what you ask? Who has the best team strip, of course. Or, as we would say, their uniforms. The creative design process follows much the same pattern as for any corporate or staff uniform. There’s a client, a brand, aesthetics, comfort and guidelines. The only thing that’s different is that replica football kits are available for retail. Football kits are big business for major sports brands. According to Reuters, Adidas netted USD2.4 billion in tournament-related revenue including 8 million jerseys, on the back of the 2014 Brazil soccer World Cup, while an analyst at RBC Capital Markets estimates that World Cup sales could add 3 to 4 percentage points to Adidas Group revenue growth this year. So the stakes are high. While the jury’s out on who will win this year’s football World Cup, the Best Dressed Football Team has already been resoundingly decided. The award goes to…. Nigeria. 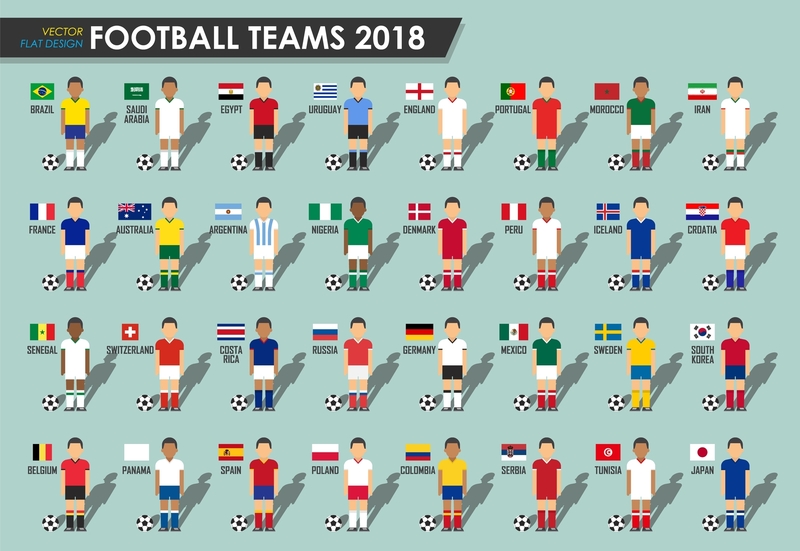 With their kit topping most media polls, a social media frenzy, and three million people pre-ordering replica shirts (according to the Nigeria Football Federation), the design of their kits has far outshone their footballing skills. Designed by Nike, the distinctive green and white jersey with a zigzag pattern, is fresh, eye-catching and distinctive. For a fascinating insight into the creative design process, it’s worth reading Nike FC’s Design Director Pete Hoppins as he explains what it takes to come up with an iconic kit. Of the 32 competing teams in 2018, Adidas will be kitting out 12 teams, Nike 10 teams and Puma 4 teams. While a design team may be working for multiple clients, they will pay close attention to each customer brief to create a bespoke uniform that will satisfy the client and differentiate them from their competitors. There are always prerequisites. For Brazil, that means yellow. So for the Nike team, that involved, “bringing out the soul of Brazil into something that is always a yellow jersey” – with a little more creative latitude in the away kit. To capture the essence and heritage of a brand requires research. Uniform designers must get into the heart of their client’s identity and style, just as football kit designers must grasp the unique mood and values of a nation. For instance, Hoppins describes Brazil as being “always clean and purist, always vibrant but it also has this kind of toughness to it”, while France is “about sophistication and style”. For the Nigeria kit, the Nike design team looked to the past, taking inspiration from their classic 1994 kit with the eagle wings. Just as companies and their uniform designers must adhere to PPE and HSE guidelines in the workplace, football is no different. World Cup kits are subject to strict design guidelines covering everything from type sizes to colours and logos. For the 2014 World Cup, FIFA published a 92-page official Equipment Regulations booklet. Much as in the corporate world, a realistic timeline, good planning and efficient process is vital to produce a national football kit, building in enough time for manufacture and shipping. Usually around two years, for Nike’s World Cup ’18 team, it was a three-year process. What makes a uniform a success? If you’ve got some creative ideas around your next staff uniform, even if you need it to be bright yellow, we can help so do get in touch.